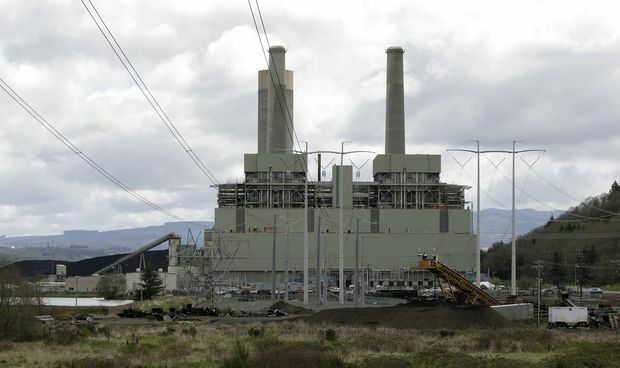 In this April 29, 2011, file photo, the coal-burning TransAlta power plant is shown near Centralia, Wash.
Brookfield will place two of its executives, Harry Goldgut and Richard Legault, on TransAlta’s board. TransAlta has also recruited the former chief executive of U.S. energy giant Dynegy to join the board. Investors reacted positively Monday, sending TransAlta shares up nearly 4 per cent on the Toronto Stock Exchange, to $9.43. Brookfield Renewable units closed up 2 cents, to $42.09. While TransAlta shares have more than doubled from 2016 lows, they remain at less that a third of their peak prior to the 2008 financial crisis. The stock hasn’t closed above $10 since June, 2015, a price that is half the levels of 2009 to 2011. TransAlta faces a challenge from a group of U.S. activist investors who revealed in March that they own 10 per cent of the company, but dissatisfaction with the company’s situation is broader, and long-standing. TransAlta was forced to restructure its business in 2015, when Alberta Premier Rachel Notley’s New Democratic Party government announced a 2030 deadline on coal-fired power in the province. It raised questions about the long-term viability of the company, the province’s largest owner of coal plants. The upheaval also included a cap on regulated electricity rates and plans to spur investment in wind and solar energy. TransAlta secured $524-million in compensation for mothballing coal units years ahead of schedule and has accelerated plans to convert a portion of them to run on natural gas. Last summer, Ms. Farrell declared that the company had emerged from the massive changes, and had cut $1.2-billion from its debt over three years to bolster its balance sheet. Still, the shares remained under pressure until early this year. New York-based Mangrove Partners said in January that it had acquired 9.4 per cent of TransAlta. On March 15, it said it was partnering with another New York fund, Cove Key Management LP, and Dallas-based Bluescape Resources Company LLC to form an investor group to influence company decisions. In that filing, the group said it had already spoken to TransAlta and believed that the company could increase shareholder value through "operational and cost excellence, asset optimization, capital allocation and broader strategic initiatives.” John C. Wilder, the executive chairman of Bluescape, is the former CEO of TXU who sold the company in the largest leveraged buyout in history and has been called the “turnaround titan” in Texas media. Monday, Ms. Farrell took pains to say the Brookfield transaction was the product of many years of discussions about multiple possibilities and was not a knee-jerk response to the activist effort. She had not spoken to the activists by midday Monday. Executives from each of the three funds did not respond to messages Monday.